Now that there’s a curb, the city-owned land at the Hill Street railroad crossing can’t be used for parking even after the crossing and new street are completed. 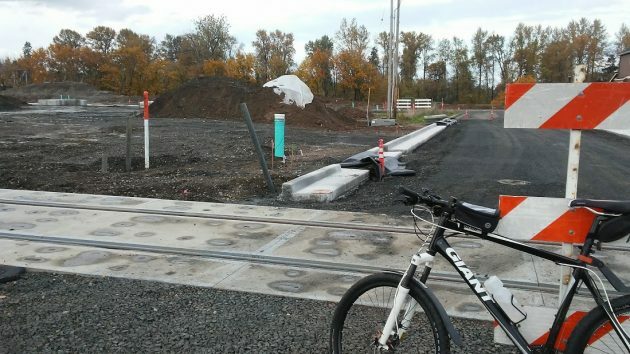 The Albany City Council has yet to decide what if anything to do with a block of vacant land it caused the BNSF railroad to hand over in 2013. But for now a previous benefit of the parcel — overflow parking at the popular Calapooia Brewing Co. restaurant across Water Avenue — has been lost. The nearly one-acre parcel west of an extension of Hill Street sits in the middle of the Edgewater Village subdivision being developed between Water Avenue and the Dave Clark Path along the Willamette river. The Hill Street railroad crossing is being rebuilt, and a contractor for Edgewater Village is building streets within the development. The city agreed in April, as an adjacent property owner, to pay the infrastructure costs of the streets adjacent to the tax lot it owns. The city’s contribution was $315,600 toward the overall cost of $1.7 million. Now that the curbs for the new portion of Hill Street, north of the tracks, have been poured, it’s apparent that people will no longer be able to park on that vacant parcel as they had been doing for many years before the construction started. Presumably they’ll be able park on the new street itself. The city got the property from the Burlington Northern (along with $35,000 and a sliver of land near the Albany Carousel) in negotiations over a new Water Avenue rail line franchise that concluded in 2012, settling a lawsuit the city had filed five years before. The last year that the railroad paid taxes on the land was 2013, when it paid $1,767. (From 1991 through 2013, the total tax paid was $28,839.) After 2013, the property became nontaxable because of city ownership. Hey…use it for CARA-sel parking. The walk would do everyone good especially if the sidewalk was painted yellow! They could find their hearts, courage & exercise their brains! Less traffic clogging downtown. No worries of time limiting parking slots. No more bad blood between the CAR-sel and the post office.Trouble is the “City” might just require back in parking.